The pomegranate is a fruit that is harvested from the pomegranate tree, a short growing deciduous shrub, growing between 16 and 26 feet tall. Originally, the pomegranate hailed from the region of present day Iran, although the plant is now cultivated in other parts of the world including Arizona and California, as well as Africa, Central Asia and the Middle East. The edible portion of the pomegranate is considered a berry, with seed count ranging from 200 to 1,400 per fruit. What is Pomegranate Tea Good For? While limited research has been done regarding the medicinal value of pomegranate or pomegranate tea, early research does suggest that the active properties of pomegranate may fight cancer and treat hardening of the arteries, according to WebMD. What Does Pomegranate Tea Taste Like? Pomegranate tea that is not prepared with another tea as a base, is naturally sweet and offers a lovely rich deep red hue. Pomegranate has a decidedly fruity flavor that is very distinct with bold undertones. Pomegranate tea is wonderfully tart, an aspect that tea lovers either love or tone down with other teas. As pomegranate is so very flavorful and fruity, it pairs beautifully with white tea, green tea, strawberry, cranberry and apple. Vanilla pomegranate offers an unexpected taste that is quite pleasant. Rose hips, hibiscus and raspberry are also wonderful when paired with the succulent pomegranate. Antioxidant Properties – Pomegranates are high in flavanols, which researchers beleive protects against damage to the body from environmental factors and natural aging. Anti-Cancer Action – Although the rind of the pomegranate is toxic, test tube studies showed that the rind, oil and juice slowed the reproduction of tumors, reports the University of Maryland Medical Center. Another study, focusing on mice with lung tumors, found that mice who where given pomegranate juice extract had slowed lung tumor growth. Additionally, a human study of men with prostate cancer who drank pomegranate juice daily doubled the time it took for their PSA levels to rise. This is vital, as those with high PSA levels have a much greater risk of dying from prostate cancer. Osteoarthritis Prevention – Flavanols found in the pomegranate work to block damage to cartilage. In fact, one test tube study showed that pomegranate extract actually blocked the enzyme that causes damage to cartilage. Anti-inflammatory Action – The same flavanols that help prevent or treat osteoarthritis also treat other forms of inflammation in the body, making pomegranate a promising treatment for swelling, sprains and strains. Pomegranate is used in Traditional Chinese and Ayurveda medicine for a variety of purposes, including as a contraceptive and the treatment of tapeworm. However, it is also used to cause abortion when the rind is eaten (a toxic part of the plant). The pomegranate or Punica granatum has a rich biochemical makeup. The pomegranate is rich in potassium, fiber and flavanoids (antioxidants). One serving of pomegranate provides approximately 12 percent of the recommended daily intake of vitamin C, 16 percent of vitamin K and 10 percent of folate. The phytochemicals found in the pomegranate, including tannins, are vital in antioxidant action. Are There Any Side Effects From Pomegranate Tea? Blood Pressure Medications – Anyone taking medication for high blood pressure. Pomegranate and many types of blood pressure medication have the potential for a moderate reaction, which can be quite serious. These medications are known as ACE inhibitors. Because pomegranate also decreases blood pressure, taking medication and using pomegranate can result in blood pressure bottoming out (going too low). Medications Changed by the Liver – Any medications that are changed by the liver can also negatively interact with pomegranate, as how fast the liver breaks down the medication can be significantly slowed. Some examples include codeine, Ultram or tramadol, amitriptyline, Prozac and Zofran, states WebMD. Plant Allergies – Anyone who has allergies to plants should use pomegranate tea with caution, as plant allergy sufferers seem to more commonly have a reaction to pomegranate. Surgery – Never use pomegranate before surgery, as it is thought to lower blood pressure. It is best to stop using pomegranate at least two weeks before a scheduled procedure. In an emergency, inform the surgical team of pomegranate use when possible. Pregnancy and Breastfeeding – There is not enough information concerning the safety of pomegranate for pregnant or breastfeeding women. Although it is possibly safe, pomegranate was used in some ancient cultures to induce abortion. Of course, this required large amounts of pomegranate (much more than found in tea) and a concoction of other herbs. However, it is best to use caution and avoid pomegranate when expecting or breastfeeding. Of course, these larger doses are not found in the average tea. For those interested in medicinal use of pomegranate and pomegranate tea, it is best to consult a licensed practitioner of TCM or folk medicine. To make pomegranate tea yourself, crush pomegranate seeds with a pestle approximately 50 times. Add a natural sweetener like honey or stevia. Immediately add hot water and enjoy. Make a larger amount for iced tea. Refrigerate immediately in a glass container and use within one month. 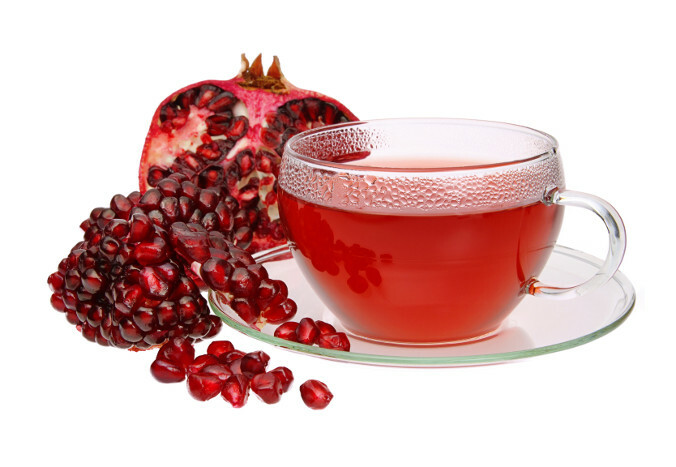 Pomegranate tea may be found in many organic health food stores and some chain supermarkets, as well as online. When possible, choose a pomegranate tea from an organic source to avoid the inclusion of harmful pesticides. Some high-quality brands of pomegranate tea include The Republic of Tea, Yogi Tea and Stash Herbal Tea. Often, green tea is the base for pomegranate tea. Some suggestions include Harney & Sons, who make a tasty pomegranate and oolong tea or The Republic of Tea, who offer a tasty pomegranate and vanilla red tea. Of course, it is also possible to make the tea from scratch with a pestle and mortar. As long as medications for high blood pressure don’t interact negatively with the tea, virtually anyone who wants to protect herself from cancer or premature aging can benefit from using pomegranate daily. 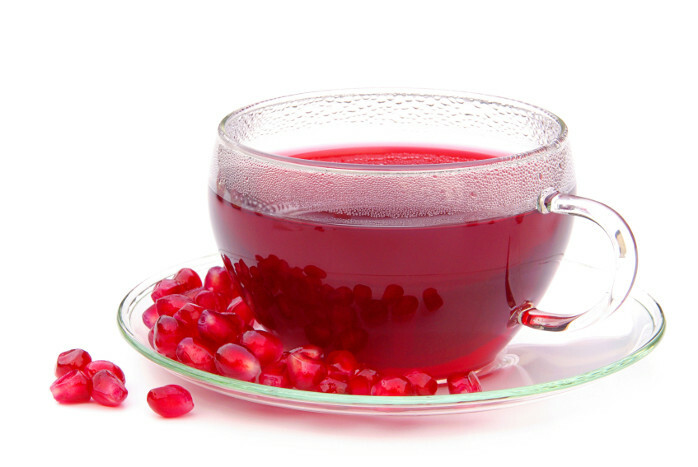 Pomegranate tea is packed with potassium and Vitamin K, essential for heart health and healthy bones. Overall, we love pomegranate tea for its rich flavor, beautiful color and healthful properties – particularly its anti-cancer and antioxidant power. Either cold or hot, pomegranate tea is a great choice for a summer vitamin boost or a winter warm up. The only downside to this awesome tea? People who have issues with their blood pressure and take a lot of medication have to use pomegranate with caution or in some cases not at all. That leaves a lot of people out, as roughly one in three American adults have high blood pressure, with another one in three adults teetering on the verge of developing the condition, according to the CDC. The irony of this interaction is that pomegranate is believed to naturally lower blood pressure, partly due to its potassium content. The pomegranate is considered the scared fruit of Persephone, indicative of her journey into the underworld. Some believe the pomegranate was the fruit eaten by Eve in the Garden of Eden. The pomegranate represents both life and death in many cultures, often found on traditional military garb. The rind and root of the pomegranate contain toxic substances.